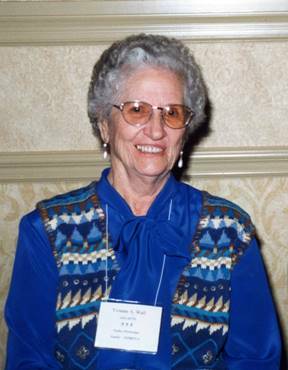 Yvonne “Betty” McMillan Alford Wall, 95, of Osyka, MS passed away peacefully at her residence on December 29, 2014. She was a dedicated wife, loving mother, grandmother, great grandmother and great-great grandmother. She was a wonderful example of faith and loved the Lord and her Church. She was born on February 22, 1919 in Pike County, MS. She was the daughter of David J. McMillan, Sr. and Mary Ola Schilling McMillan. She was preceded in death by her parents, her first husband Harlon Alford, her second husband Earl Brewer Wall, Sr., 11 brothers and sisters, and her granddaughter, Jennifer Sturdivant Rowland. She is survived by her two children, Nolan David Alford and wife Mary of Mt. Hermon, LA and Dianne Sturdivant of Madison, MS. She is also survived by her children from the Wall family: Patsy Wall Taylor, Earl Wall, Jr., Percy Wall, Barbara Wall, and Teresa Wall Dixon. Her grandchildren, Harlon Alford, Karen Alford Smith and Brenda Alford Smith and grandchildren from the Wall Family, Ronnie Taylor, Cheryl Lyons, Pamela Ball, Greg Taylor, Robyn Eldridge, Renee King, Tamara Pitre, Crystal Langlois, Zack Phillips, and Josh Phillips and 29 great grandchildren, one great -great grandchild and numerous nieces and nephews, along with countless other friends and family whom were blessed by her. 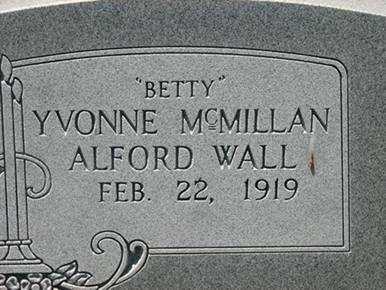 Mrs. Wall was a housewife, owner/operator of Alford’s Grocery and Appliance in Mt. Hermon, LA and a Nurse’s Aide. She was the oldest member of Osyka Baptist Church and served her church faithfully for many years in numerous capacities: Church Hostess, Sunday School Teacher, President of Young at Heart, Vacation Bible School worker, and organized Children’s Church. She was the Osyka Senior Citizen of the Year in 1998 and was honored as Osyka yard of the month numerous times. Mrs. Wall touched the lives of many people with her faith and kindness, and maintained this all the way to the end. Friends and family are invited to attend her Celebration of Life Services at Osyka Baptist Church on Thursday, January 1, 2015 with visitation from 9:00 am to 1:00 pm, funeral service at 1:00 pm, and burial service to follow at Mt. Hermon cemetery. Pallbearers will be Paul Donough Alford, Jamie Harrell, Wes Ott, Tommy Simmons, Clay Smith and Gene Bordelon…. AAFA NOTES: SSDI records do not yet list her death. We included the obituary of her husband, Harlon Alford, in Louisiana Obituaries. Betty joined AAFA long after her husband’s death. For more information about this family, see AAFA’s published genealogy, Known Descendants of John Seaborn Alford 1807 NC–1891 TX. Her husband’s lineage: Harlon 1912 LA1, Nolan Bannon 1883 LA2, John Griffin 1850 LA3, John Seaborn 1807 LA4, Jacob 1761 NC5, Julius 1717 VA6, James 1687 VA7, John 1645 VA8.